Your trees may sustain significant amounts of damage if a storm comes along and causes flooding. Spring and summer tend to bring lots and lots of rain here on the East Coast. That means one thing: flooding. Over the last several years, it seems like storms are getting more frequent and more intense. Your trees may sustain significant amounts of damage if a storm comes along and causes flooding. Here are a couple of the ways that flooding can affect your trees! Tree roots require oxygen in order to grow and thrive. When there is flooding, water comes in where there was once air. This essentially suffocates and drowns the tree’s roots and if it is prolonged can irreversibly damage a tree. Flooding can also change the pH levels in the soil. 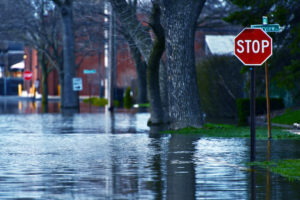 Some trees and plant life are okay with slight environmental changes but many are not well equipped to deal with the sudden and intense changes that flooding can bring. Driving rains, strong winds, and other conditions that often accompany flooding can cause significant physical damage to trees. Soil erosion can expose roots, which leaves trees vulnerable to all sorts of damage and disease. If there is large enough frozen precipitation, the pieces of ice can actually chip away at the tree bark. When flooding occurs, it often forces insects to relocate. Many of these insects end up in trees. Some will bore holes in the bark in an effort to find shelter. Many will feed on the leaves. They will move in wherever they have to in order to stay out of the water’s way. This harms trees because not all trees can support other life, especially younger trees. If a tree is older, larger, and more established it will take a lot more insects to damage it. A young enough tree could potentially be killed by insect damage. This entry was posted on Thursday, March 29th, 2018 at 5:32 pm. Both comments and pings are currently closed.